Bring the whole family out to the American River Ranch for activities, tours and classes. Our organic produce is spectacular this season. Featuring organic fruit and vegetables, local honey, eggs, jams, baked goods, herbs, flowers, special products from local farms and unique and practical gifts for the cook and gardener. 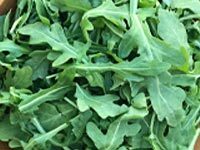 Greens: arugula, kale, braise mix and salad mix; Produce: radish, turnip salad, red and green cabbage and fennel; Alliums: green garlic and spring onions; Herbs: bay, rosemary; Fruit: grapefruit. Try our signature hot beverages: fresh-brewed herbal tea, chai and coco-cocoa and delicious scones, muffins and more. We will be serving a Earth Day celebration brunch at the Farmhouse Kitchen window beginning at 9:30am until we run out. Get your lunch ticket at Phoebe’s Tea & Snack Bar for an $8 donation. Proceeds benefits our Eat the Rainbow culinary arts program. Green Plate Special: Organic farm fresh seasonal frittata, roasted potatoes, mixed greens, baguette and butter. $8 donation. Kids plate: Farm animal-shaped Belgian whole grain waffle with organic maple syrup, organic apple sauce or organic juice pouch. $5 donation. Learn how to prepare seasonal produce in simple and delicious ways. Tasting samples, recipes and nutritional information will be available. We have a unique selection of practical gifts and tools for cooks and gardeners. You’ll find sustainable items to support a healthy lifestyle and the Earth. We have culinary and medicinal herbs, handcrafted garden boxes, quality organic seeds and more. Purchase a limited-edition Home Grown T-shirt and USA-made ceramic Soil Born Farms mugs. Proceeds support the restoration and development of the American River Ranch Center for Food, Health & the Environment. Kid’s Activity Tent: Make nature portraits. Lil’ Sproutville : Kids of all ages can play and relax under the pine trees. Check out the growing fairy and gnome village, make music on the instrument fence, walk the fava bean labyrinth and more! Youth must be accompanied by an adult. Enchanted Youth Garden: Calling all fairies, elves, gnomes and nature spirits, follow the signs, come play and explore. Build fairy and gnome homes, construct a toad abode and experience the magic of the garden! American River Ranch, 2140 Chase Dr., Rancho Cordova. We encourage you to bike or walk to the ranch, bring your shopping bag, and take a self-guided tour around the farm. Cash, credit card and EBT accepted. Scholarships allow youth from all socioeconomic backgrounds to attend our enriching programs at the American River Ranch and help build important connections to the natural world, the farm, their health and their community. Experiences here can have lifelong impacts on youth, our farm and our planet. The requests are far greater than our current budget can fulfill. This fund will support field trips, summer camp experiences, after-school programs, teen empowerment and job training. ($1,000). A collaborative effort of area residents, non-profits, community groups and businesses which harvest underutilized fruit and vegetables from backyards and small orchards and donate it to local food assistance agencies. A beginning farmer and gardener training program designed to provide knowledge and hands-on experience to the aspiring urban grower. Our instructors are experienced masters of organic agriculture and horticulture and experts in farm entrepreneurship. Cooking demos and educational projects at the farm stand and in the community. Teacher training program supports the Garden in Every School movement, established by Delain Eastin and includes hands-on trainings and an annual symposium. Our youth education program focuses on experiential, hands-on learning in the natural world and in the kitchen. 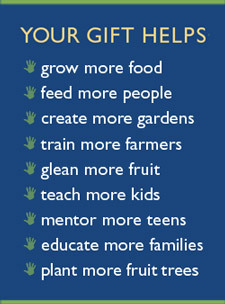 Activities include: field trips, classes, workshops, farm tours, summer camp and job training. Create, manage and support urban organic farms and gardens that are accessible to the public, permanently protected for future generations, and that practice and promote responsible land stewardship. Develop a food and environmental education program focused on service and experiential learning in the natural world and in the kitchen for youth and adults. Activities include classes, hands-on workshops, tours, job training and youth leadership development. Address food security needs by developing alternative food distribution and food donation programs that target our underserved communities. Bring people together to celebrate cultural diversity and share the simple pleasures of living life in harmony with nature. Take a guided walk around the ranch and learn about the birds that live in the American River Parkway. Ideal for beginner to intermediate birdwatchers. *Proceeds support the American River Ranch Restoration & Development Fund. Instructor: Cliff Hawley.